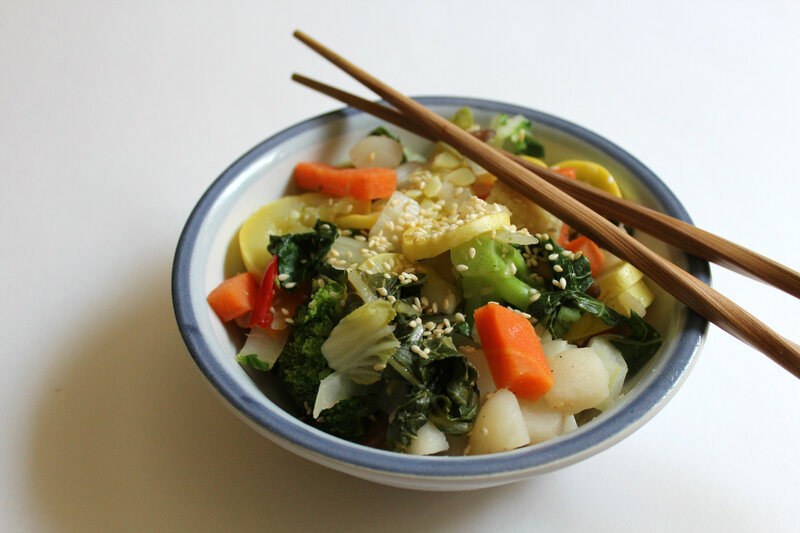 My favorite dishes to flavor with sesame is always a veggie stir-fry or steam. 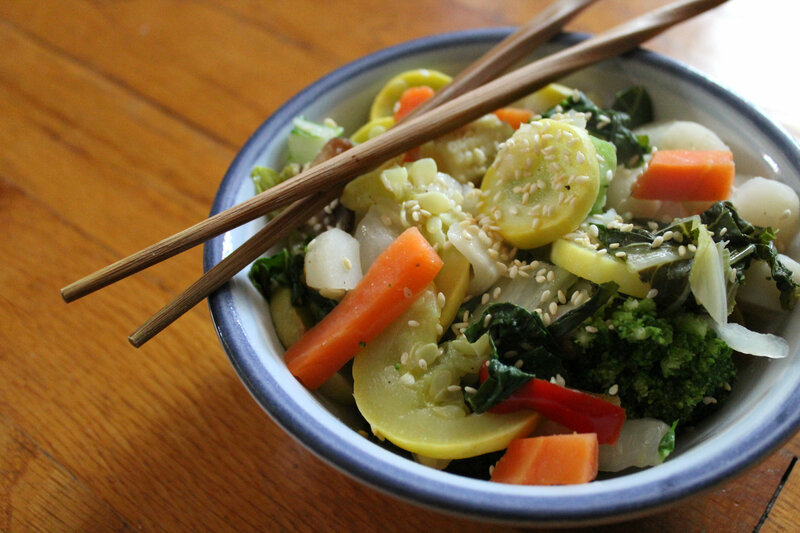 This dish is totally adaptable to fit whatever veggies you can find, but no matter what it always comes our so good! The recipe below really isn’t a stir fry, but a steam. It is full of Asian inspiration and sesame flavor. + Chop and prepare all the veggies, then add them to a very large saute pan. Add the water and cover. Place on the stove on high for 5 minutes, then reduce heat to medium and cook for 10 to 15 more minutes. + Once the veggies and cooked but still have some crunch, remove from heat and drain any excess water. Place back on medium heat, uncovered, and add the rice vinegar, onion and garlic powder, ginger, and black pepper. Stir to combine. + Once the vinegar is absorbed and flavors combined, add the sesame oil and sesame seeds and stir. Remove from heat and serve! Top with additional sesame seeds (and raw unsalted cashews!) for a beautiful presentation. Do you like Sesame? What is you favorite Sesame dish? Have you ever used tahini? This is the one sesame product I have yet to try! I obviously have had it in hummus, but have never bought a jar on its own. I think I need to get some ASAP. 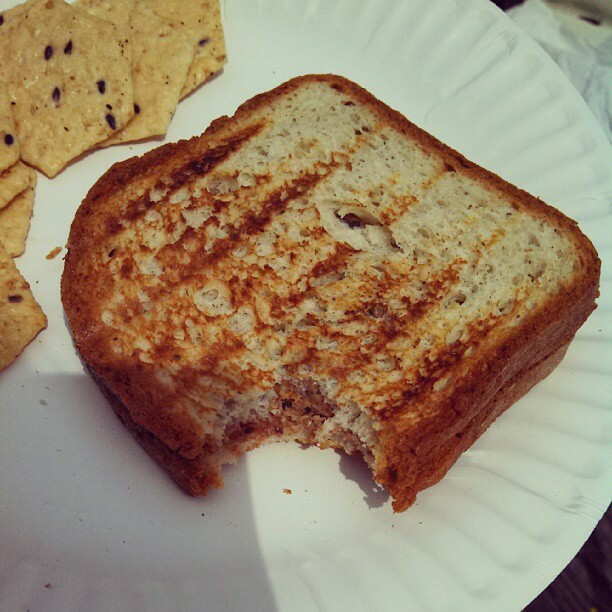 A Sunflower Seed Butter + Apple Butter sandwich on Udi’s Multi-Grain Bread (this picture is form the Summer so I had time to grill my sandwich on my mini George Foreman Grill…sadly now I don’t), some sort of crackers for crunch and a side of easy to cut up and eat fruit (like grapes, kiwi, or berries). These combos are both so good and perfect for me and I never get bored of them since I always switch up the little things in each. 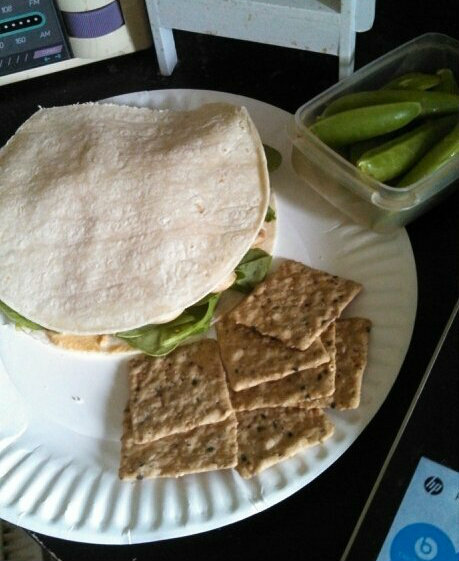 But I can tell you I hate wrapping up my sandwiches (especially the hummus sammy…it is so floppy and really hard to handle…but worth it) and getting all my snacks ready for school. I do this all the night before except I make the sandwich in the morning so it stays more fresh. Then I get to eat in my Ancient History class since I have no lunch period. O the joys of school. Now for the new “recipe”. It is really quick and I just threw it together so I hate to call it a recipe but o well. So instead of sprouting lentils again last week, I sprouted black beans! I used the same method although they took one more day to get to the sprout I wanted. But I loved them and even though I have been eating tons of beans and legumes lately my stomach has been pretty good with it. I believe it is the sprouting since that breaks down all the hard to digest compounds. 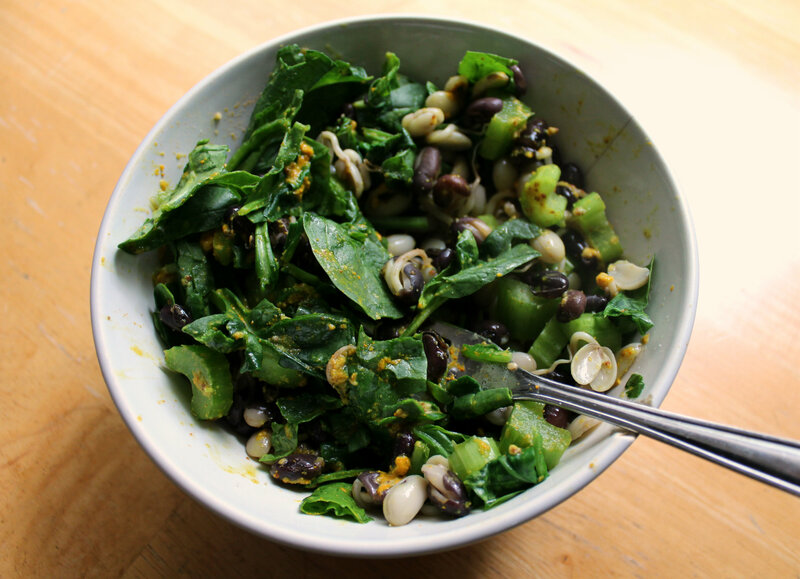 So if you find beans and legumes hard to digest, sprout them and I am telling you your body will be happy! – Bring a pot of 1 cup of water to a boil and add the beans for about 10 minutes. Remove and set aside. 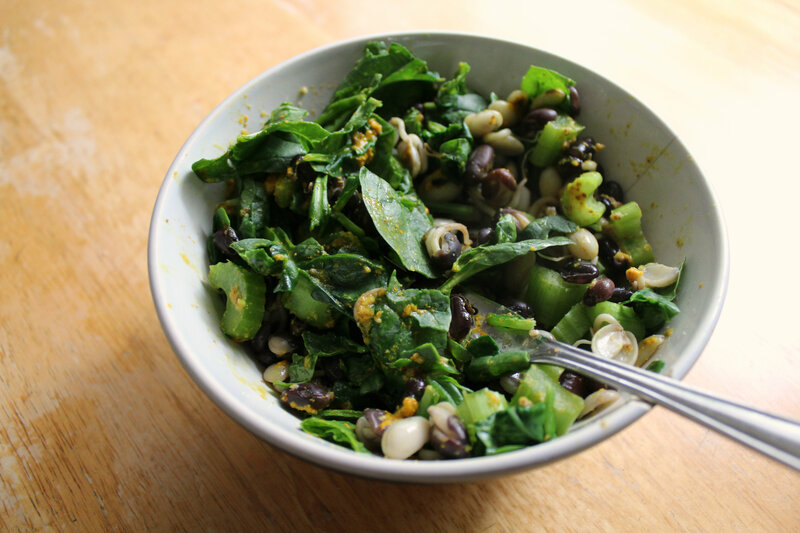 – Get all you veggies and spices together and then add the beans to a large bowl with all the other ingredients. Toss and coat everything around. – Next pop the bowl in the microwave for about two minutes, stirring half way through. Take it out, taste, adjust seasonings to your liking, and enjoy! I also have two other memorable dinners that I loved recently and wanted to share…they deserve the attention. 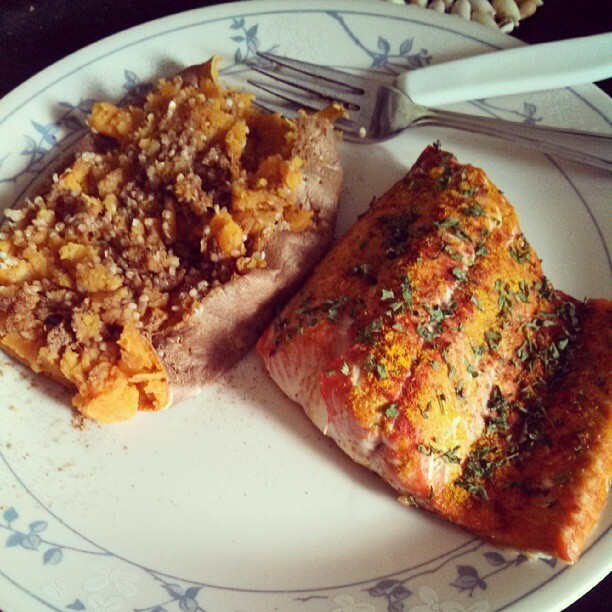 First up is Smoked Paprika Turmeric and Parsley baked Salmon + a Micro-baked Sweet Potato with Cinnamon and Hemp Seeds. This Salmon fillet was so good. Like the best I have had…ever. I guess sometimes ShopRite’s seafood department does get it right! 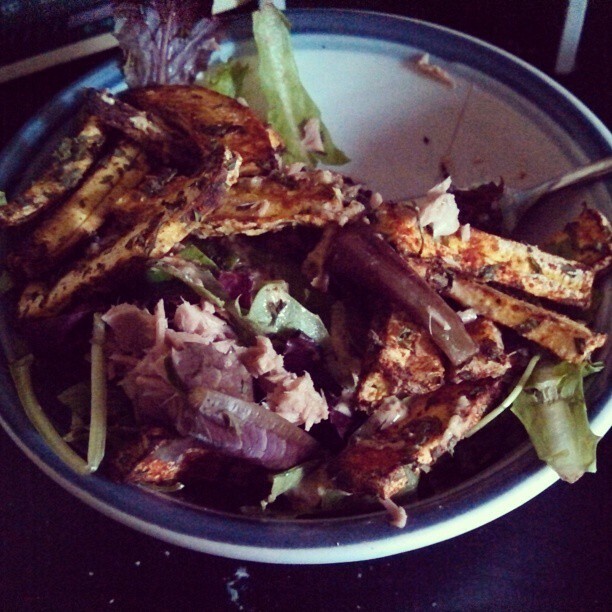 Next is a random bowl of goodness that consisted of a can of salt-free Tuna, Mixed Greens, Smoked Paprika Plantain Fries, salt-free Stoneground Mustard, Lemon Juice, and more Smoked Paprika. I have been loving throwing together these bowl type dinners! So easy and fun and a nice change from my normal dinners. Okay that’s all for this WIAW! Remember to link up and join in on the fun! What has been you most stellar dinner creation lately? 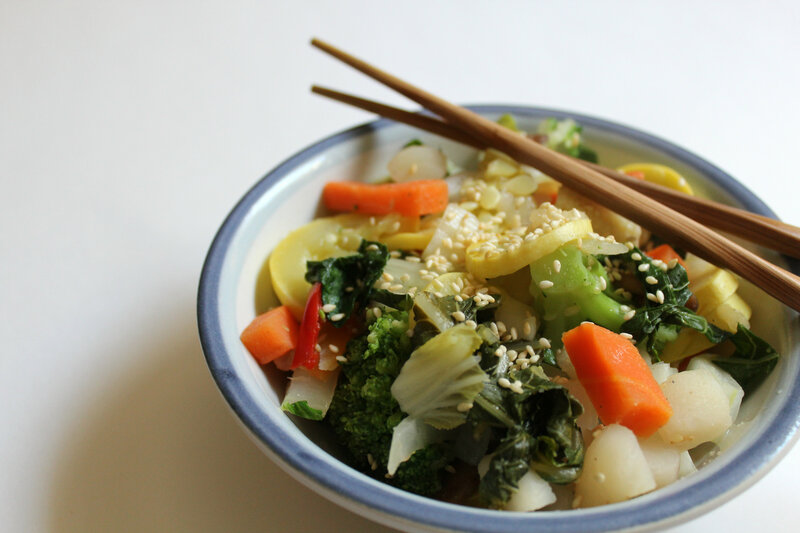 Do you like throwing together random bowls of ingredients when you have no idea what you want? I totally love doing this now and will definitely be keeping this idea for a go-to when I am in a dinner rut!